As an administrator of your platform, you can access the user management space by going to the Administration Organization, then to "Manage Users." By default, the list of users that is displayed is the list of active users. You can filter the users according to several criteria if you click on the "Active User" button. Active users: users to whom a licence was allocated. Deactivated users: uses whose account was deactivated. This list can be useful if you need to reactivate certain users' access to the platform. 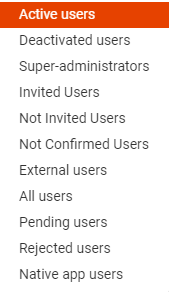 Super-administrators: users with extended administration access. Invited users: users who have received an invitation to connect to the platform. Not invited users: users who haven't received an invitation to connect to the platform. External users: users who have limited access to the platform. They cannot access public spaces unless they were invited to do so. All users: active and deactivated users. Pending users: users who are waiting for your approval to join the platform. Rejected users: users who were denied access to the platform. Native app users: users who have downloaded the mobile app on their smartphone and/or tablet.